This is the first in our series “Profiles in Service” where we hope to connect Athens with the community organizations that are making a difference. Tuesday night, I spoke on the phone with Melaney Smith, the founder and executive director of Books for Keeps. Books for Keeps is a children’s literacy organization that works within five Clarke County elementary schools to give each child twelve books to take home and read over the summer to combat the “summer slide” or lost time where children who aren’t engaged academically fall behind peers who are engaged. 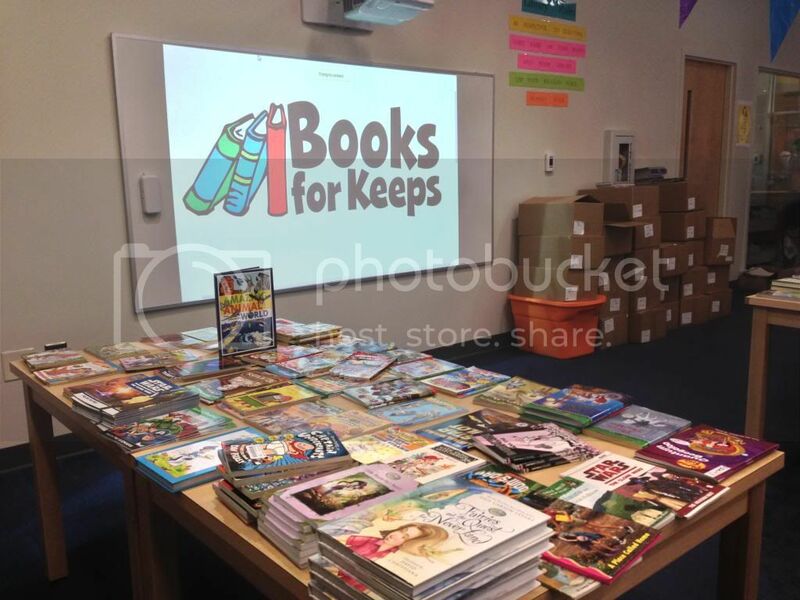 Books for Keeps works with organizations like Scholastic and First Book to get discounted new and popular books to schools that are then donated to children. They spend two weeks out of the year distributing books at Gaines Elementary, JJ Harris Elementary, Fowler Drive Elementary, Alps Elementary and Stroud Elementary. For the other 50 weeks of the year, they collect, inspect and sort through books donated to them. To get involved, check our their website and Facebook page for volunteer opportunities and book drop-off locations. We hope that if you have some extra books or time that you will support this organization doing great things in our community. Here is a transcript from our discussion tonight. It has been lightly edited for clarity. Kyle: Tell me a little bit about Books for Keeps and how it got started. Melaney: We’re an organization that gives books to children at the end of the school year to make sure that they have access to books over the summer. We’re trying to prevent “summer slide” which is a reading achievement loss that occurs in children who stop reading and stop learning over the summer. Students who do not read over the summer can actually fall two to four months behind their classmates who do read over the summer. A lot of times, the reason that they can fall behind is because they do not have anything to read. Not everyone, especially elementary school aged children, can get themselves to the library. They are dependent on their parents to take them. It started when I met a little girl introduced to me by my niece. She had overheard this girl talking with a friend in the Alps Rd. Mentor Room about how much they loved to read and how sad they were that summer was coming because the school library would be closed. This was the only source of books for them. My niece was surprised to hear that anyone would not be looking forward to summer but when she understood that they were not going to be able to read she understood why. Anyone that loves to read would cringe at the thought of spending the entire summer without anything to read. I thought I was just going to do this one time project to get this girl and her friends some books but when I talked to the family engagement specialist at Alps, she said that there were other children in the same situation. How about giving books to the entire 2nd grade? So there were 80 children and I gave them three books each with the help of my mother and some family friends and it grew from there. Once we learned what summer slide was and read some research about it, thats when I realized where this was headed. Someone sent me some summer slide research done by Richard Allington which found that children who read 12 books (as long as they were the right books) over the summer were gaining a statistically equivalent learning experience to those attending summer school. We are following the message used in Dr. Allington’s studies and one of the researchers advises us and helped us especially in the early days set up how the program was supposed to be done. He taught us that you have to have books that the children actually want to read. If you have leftover, older books that aren’t popular anymore, they may take those books home but they aren’t going to read them. So we go out and find the most current books that we can afford and that is what we take to the schools. Kyle: How did you start your relationships with Scholastic and First Books? Melaney: First Books is an organization that works to serve organizations like ours. They have relationships with publishers and serve as a clearinghouse for leftovers and make those available to non-profits. Scholastic gives non-profits a pretty significant discount, but most of their books are still outside of our price range even with a 75% discount. We try to stay under two dollars a book which works out to be roughly $25 a child when we factor in a tote bag and supplies. Scholastic has a program called Scholastic Literacy Partnerships and if you qualify as a non-profit, you can get the discount pricing. Kyle: What schools do you work in? Melaney: Our core program is an elementary school program called the Stop Summer Slide Program. That is what our effort and funding are focused on. But in the process of collecting books in book drives for elementary school, we get a lot of books that are suited for adults, children in Pre-K, or middle and high school students so we pass a lot of those on to the middle and high schools or Pre-K children. We are trying to catch children early because 6th grade reading scores are such an important indicator of how a child will fare in the future. I think 6th grade reading scores are used to predict anything from high school graduation rates to prison populations. I feel like everyone has latched on to those numbers so I feel like if we can help children shore up their reading skills before they get to 6th grade, that is where we are doing the best service. Kyle: And are the schools you work in in Clarke County? Melaney: Yes, we are in five Clarke County schools right now. We have only been an organization for two years so it was a pretty big deal for our organization to go from our first project (240 books for 80 kids) to our next project (3 schools) and now we are in 5 schools. We are tying to reach all of the elementary schools in Clarke County where 90% of the kids qualify for the Free and Reduced Lunch Program. Two more Athens schools have now hit the 90% threshold. One of those two schools is pretty big and the two new schools would add 1000 students to our program. We currently serve about 2000 in our five current schools so adding those two schools is a pretty big leap. That is what we are going to be focused on right now is trying to raise the funds and the books to go to those schools. Melaney: Everything they need to know is on our website. We have everything from how to donate books to where our drop-off locations are. We have a link to our newsletter for volunteer opportunities. And of course there is always our Facebook page. We don’t have an office at this point. We are currently operating in donated warehouse space. Kyle: Where do you see your program going from here? Melaney: We are working with some reading researchers to evaluate our results over three years. We are one year in. We think that having that information is going to let us tweak the program and figure out where it is working best and where there is room for improvement. In my mind, if those results are favorable, there would be no reason not to roll this program out further. I think we will continue to expand as long as we have the capacity. We are running out of warehouse space so we are going to have to find some more space to do that. We have some challenges of scale this year that we will have to address. We see it definitely expanding in Athens but we are approached all the time about it expanding outside of Athens as well. We have heard from people all over the country. Right now we are looking to go to two smaller schools. One would be in inner city Atlanta school and one would be a rural Georgia school. There are rural counties in Georgia where 100% of their students qualify for the Free and Reduced Lunch Program. We participated in the Clinton Global Initiative two years ago and we committed to them that we would test the waters of expanding outside of Athens in that small way. It doesn’t do anything to take away from our Athens program but it does give us the opportunity to see what it would be like to try to reach a school not in Athens. But we are also really focused on Athens’ schools right now.